Note: Click here if you would like to watch a complete, step-by-step video tutorial how to upgrade your BiteFX for Windows software to V3.0. 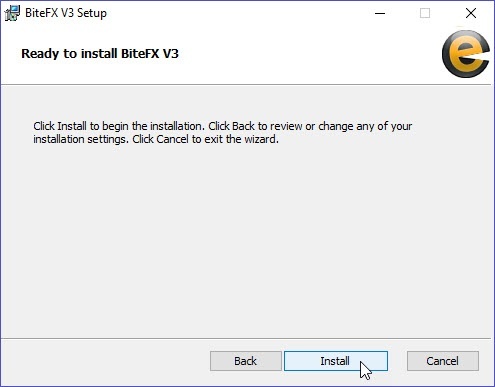 The process of upgrading BiteFX requires the installation of the new BiteFX V3.0 software using an installer file that has been downloaded from the Internet. There are two ways the installer file can be downloaded, download it yourself from the Internet or let the BiteFX update process download it for you. With the update method, with BiteFX V2.5 installed, update #67 automatically downloads the installer file as part of the update process. Once you go through either method, you'll realize that they are both straightforward and easy to perform. However, because I'm detailing every little step in this blog, and covering several different browsers, a quick scan of this blog may make you think the process is complex - it's not! It should only take you a few minutes to do the upgrade once the installer file has downloaded. If you have multiple computers in your office that need upgrading, or if the update process has not already downloaded the installer file for you, then you will want to download the BiteFX V3.0 installer file from the Internet yourself. (Note: with this method, you should uninstall BiteFX first before installing BiteFX V3.0). Go to Downloading the BiteFX V3.0 installer file yourself. If you only have one or two computers to upgrade and your software has already downloaded the installer file (Note: with this method, it is not necessary to remove V2.5 first). If the Upgrade Available dialog shown below does not appear, it has not downloaded the installer file yet, so it's better to close BiteFX and download the file yourself. Go to Downloading the BiteFX V3.0 installer file yourself. Click on "Yes" to begin the installation of the new software. Go to Installing BiteFX V3.0 using the BiteFX Setup Wizard. Before you start the download, you can open your browser of choice and verify the Internet connection is working. We recommend you uninstall your BiteFX V2.5 software first. In the browser of your choice, navigate to www.bitefx.com and login to the Members page. Click on Software Download in the Online Support section, and then click on the BiteFX on Windows link. For Microsoft Edge, Internet Explorer, and Mozilla Firefox browsers you should always select the "Save" option. 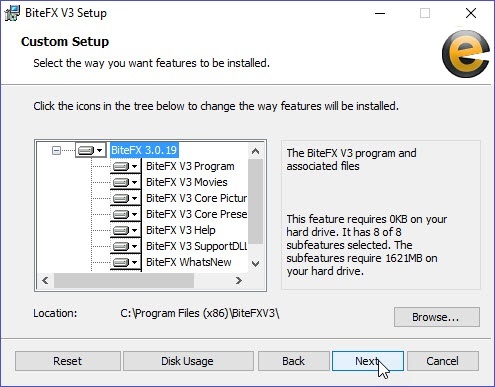 You can then copy the installer file to a shared drive or USB flash drive to quickly install BiteFX on other computers without requiring the download step. At the end of the blog, I provide a summary of the steps in Download and Installation Steps Review. By-the-way, the steps are basically quite simple and you'd probably do fine if you just "followed your nose" but I spell everything out in detail in this blog so that, if you do not regularly download and install software, you can see exactly what you should do "every click of the way". The Google Chrome browser connects to the download site and download automatically begins. At the lower left corner of the browser window you can monitor the download status. The time it takes to download the BiteFX installation package is primarily dependent on your Internet connection speed. The download may take 30 minutes or more as it is a large file (approximately 1.6 GB). Click on the "Up" arrow, then click on Show in folder to open the Downloads folder. To save the installer file to perform additional upgrades, go to Saving the V3.0 installer file for additional BiteFX software upgrades. If not necessary, go to Installing BiteFX V3.0 using the BiteFX Setup Wizard. 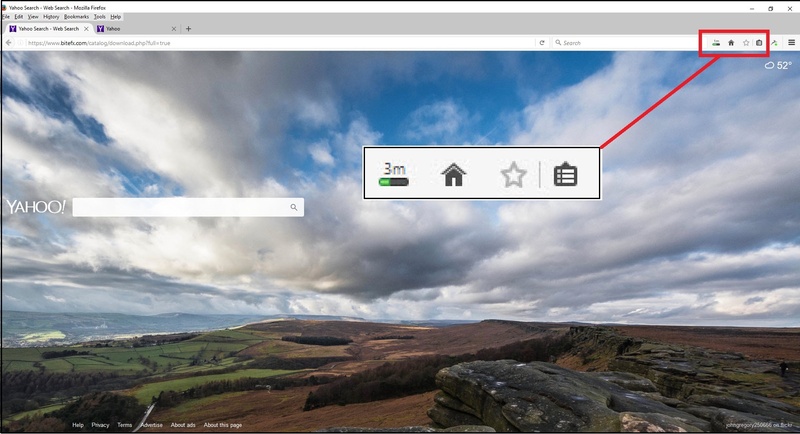 Clicking on the download link automatically opens the Microsoft Edge browser. You will be asked what you would like to do with the installer file; click on "Save". The installer file will be downloaded and saved to your computer's Downloads folder. When the installer file has finished downloading, you will be see the following prompt. Click on the Open folder button to open your Downloads folder. Clicking on the download link automatically opens the Internet Explorer browser. You will be asked what you would like to do with the installer file; click on "Save". The installer file will be downloaded and saved to your computer's Downloads folder. When the installer file has finished downloading, click on "Open Folder" to open the Downloads folder. Clicking on the download link automatically opens the Firefox browser. You will be asked if you would like to save the file or cancel; click on "Save File". The installer file will be downloaded and saved to your computer's Downloads folder. A download progress icon will appear on the right side of the Firefox toolbar. If you click on the Progress Bar icon, a more detailed progress window will appear. When the installer file has finished downloading, the download progress icon will change to a solid blue down-arrow. If you click on the arrow icon, a more detailed progress window will appear. Click on the folder icon on the right side of the window to open your Downloads folder. Note: If you used the update process to download the installer file, you can skip Step 1. Once the BiteFX installer package has finished downloading, open the Downloads folder and double-click on the installer file name. A Preparing to install screen briefly appears, followed by the BiteFX Setup dialog. Click on the Next button to begin installing the new BiteFX software onto your computer. The End-User License Agreement dialog will appear. You can review the entire agreement here. When you are ready, click inside the box indicating that you accept the terms of the agreement and then click on Next. A BiteFX Setup dialog opens to allow you to customize the way you want BiteFX features to appear, as well as where the program files will be stored. Except in unusual circumstances, we recommend you simply click on the Next button to install BiteFX using the default settings. The BiteFX V3 Setup dialog opens for you to start the installation process. 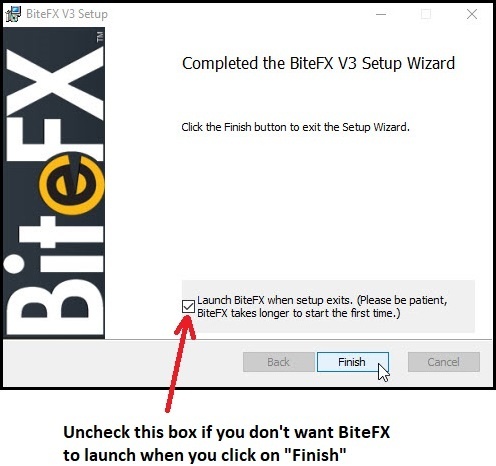 Click on the Install button to begin installing the BiteFX software onto your computer. The installation will take several minutes to complete. A new dialog opens with a progress bar to display the installation progress. 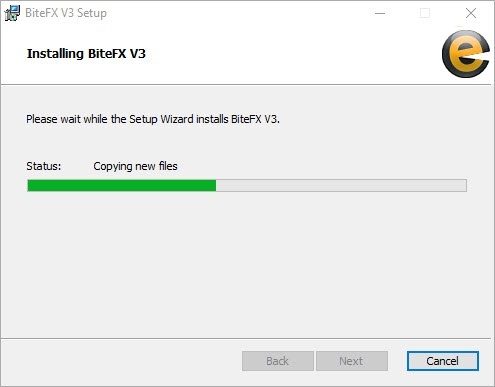 When the installation is complete, the final setup dialog appears indicating that the BiteFX Setup Wizard has been completed. If you do not wish to launch BiteFX automatically, be sure to uncheck the box adjacent to the text “Launch BiteFX when setup exits.”. The last step of the installation process is to click on the Finish button. Upon completion of the installation, a BiteFX shortcut icon will automatically appear on your desktop. You can now open BiteFX and register it using one of the unused serial numbers provided in your BiteFX Order Confirmation email. If you can't find your serial numbers, please contact us and we'll be happy to provide them to you. Once the V3.0 installer file has been downloaded, you can copy it to a shared folder on your network, or to a USB flash drive and use that installer file upgrade other BiteFX software in your office. Create a folder on the shared drive of your choice and name it appropriately (perhaps "Bite Installer File"?). On the computer you used to download the installer file, open the Downloads folder on your C: drive. Right click on the BiteFX installer file name and select "Copy" from the list. Right click inside the open installer file folder you created in Step 1 above, and then select "Paste" from the list. You can now upgrade your remaining BiteFX software by going to each computer where it is installed, navigate to the shared folder and double-click on the copied installer file name. 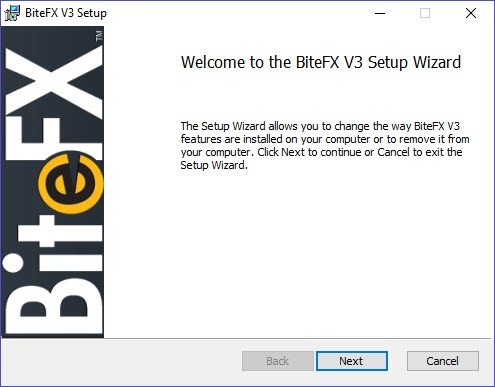 To begin the next installation, go to Installing BiteFX V3.0 using the BiteFX Setup Wizard. Right click inside the open USB flash drive directory, and select "Paste" from the list. Remove the USB drive safely. You can now upgrade your remaining BiteFX software by plugging the USB flash drive into each computer where BiteFX is installed, open the USB drive directory and double-click on the copied installer file name. 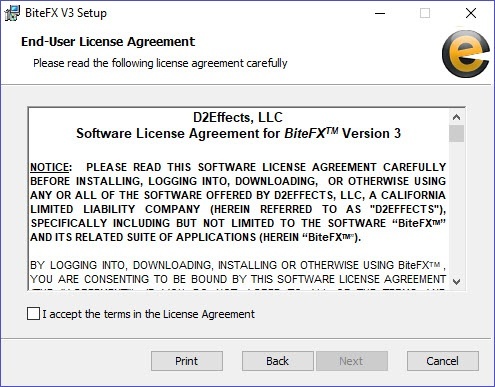 Download the BiteFX V3.0 installer file using either the update process, or by downloading the installer file yourself from the Members page. If you downloaded the installer file yourself, uninstall the existing BiteFX software before installing the new software. For Microsoft Edge & Internet Explorer, click on Save; for Mozilla Firefox click on Save file. For Google Chrome, after the download is completed, double-click on the downloaded *.msi file. For Microsoft Edge and Internet Explorer, after the download has completed, click on Run. For Mozilla Firefox, after the download is completed, double-click on the downloaded *.msi file. When the BiteFX Setup Wizard opens click on Next. Review the End-User License Agreement, check the box that you agree to the terms, and click on Next. When the Custom Setup window opens, click on Next unless you need to change the default BiteFX setup. When the Ready to install BiteFX window opens, click on Next. When the installation process is complete, click on Finish. Right-click on the BiteFX shortcut icon and select Run as administrator, then click on OK.
Run the update program to install any new updates that have been released to bring the software up to the most current version. Note: if you prefer, you can obtain an Installation DVD from BiteFX for a nominal shipping and handling fee. Please contact BiteFX to order your Installation DVD.